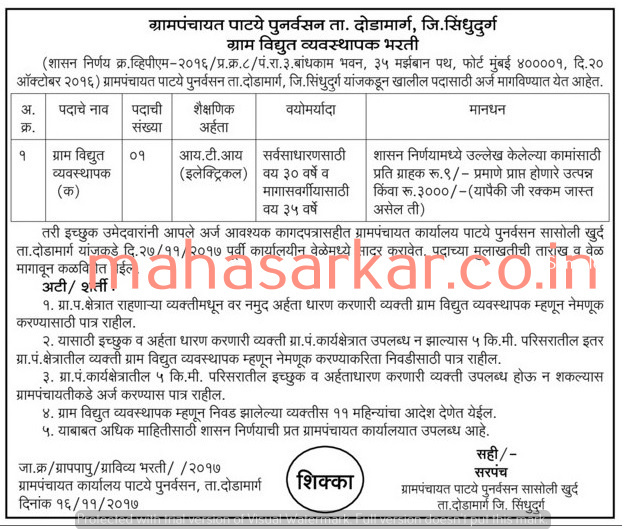 GP Sindhudurg Rehabilitation Department (Gram Panchayat Rehabilitation Department), Sindhudurg Published Job Notification for 01 Village Electrical Manager Posts. Candidates who wish to apply must look at GP Sindhudurg Rehabilitation Department Village Electrical Manager Recruitment 2017. Eligible candidates can join walk-in Interview on 27-11-2017. Education Qualification: Must have ITI in Electrical department and More. For Post wise Education Details follow the detailed advertisement. Interested & Eligible candidates may attend for walk in interview along with all the documents addressed at ग्रामपंचायत कार्यालय , ग्रामपंचायत पाटये पुनर्वासन सासोली खुर्द ,ता : दोडामार्ग , सिंधुदुर्ग. Starting Date, Last Date to Apply Offline at Gram Panchayat Rehabilitation Department which candidates should be remember as follows.